From September 2008 to October 2012, during the height of the foreclosure crisis, the American people experienced approximately 3.9 million completed foreclosures. Alternative dispute resolution became an important part of the foreclosure recovery picture, with jurisdictions throughout the country establishing mediation programs to handle the flood of foreclosure actions. It was against this backdrop that RSI led the way in foreclosure mediation research and program design, and continues to serve those who grapple with the prospect of losing their home. Tracking the status of all foreclosure mediation programs in the US and making program information available on our online Resource Center. Analyzing how foreclosure mediation programs fund their processes. Facilitating meetings to assist stakeholders in exploring how they might use mediation to address the housing crisis. Training and educating foreclosure dispute resolution neutrals around the country, including Hawaii, Utah and Washington. Commenting on draft rules, legislation and procedures for new foreclosure mediation programs. Work closely with the Center for Conflict Resolution and other program partners to develop the mediation portion of the Cook County Mortgage Foreclosure Mediation Program. We continue to provide expert research and assistance to the program as questions arise. Create post-mediation questionnaires to enable the Cook County program to assess participant satisfaction and report statistics to the Court. Train mediators and develop, monitor and evaluate grant-funded foreclosure mediation programs throughout Illinois. Participate in national bar association and federal government meetings about designing and evaluating foreclosure mediation programs. "[RSI provided] a solid and motivating training program with the flexibility to anticipate and adapt to the changing landscape, from non-judicial to judicial foreclosures, and to focus on developing our ability to put together and offer a more cost-effective loan modification evaluation and solution process than any available judicial or non-judicial process." – Charles Crumpton, lawyer & mediator, Crumpton & Hansen, Honolulu, Hawaii. RSI trained Mr. Crumpton and other experienced mediators in 2011 for Hawaii's non-judicial foreclosure dispute resolution program. In the summer of 2013, RSI received a large grant from the Illinois Attorney General to incubate foreclosure mediation in Illinois. This grant was funded by National Mortgage Settlement funds, for a period of three years, later extended to five. 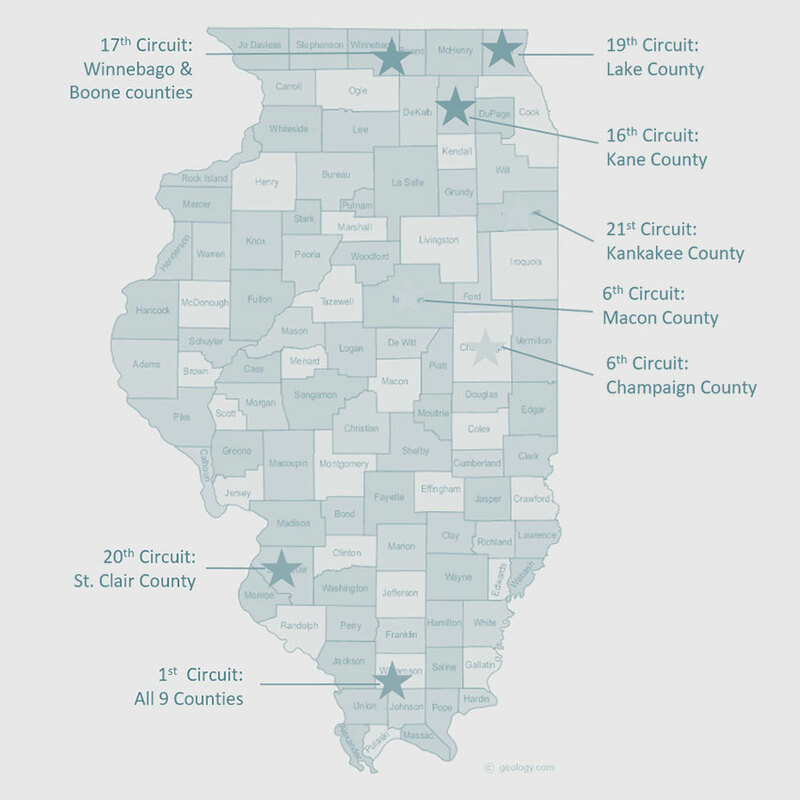 RSI has worked to design, administer, monitor and evaluate foreclosure mediation programs throughout Illinois. RSI worked with grant partners Dispute Resolution Institute (DRI), Northern Illinois University College of Law (NIU) and the University of Illinois College of Law's Community Preservation Clinic (U of I) to train mediators for eight different programs throughout the state of Illinois. We also conduct all of the monitoring and evaluation for each of these programs. The bulk of RSI's responsibilities under the grant, however, involved the administration of three foreclosure mediation programs throughout northern Illinois. In each of these programs, staff work with the court, court clerks, housing counseling agencies and/or legal aid organizations, lender representatives, bar associations and other stakeholders to manage the smooth and timely flow of cases. The grant concluded on August 31, 2018. Data current through August 31, 2018. Under the grant, RSI is responsible for monitoring and evaluating grant-funded foreclosure programs statewide, our three programs and those conducted by our program partners. To this end, RSI has developed a cloud-based data collection, monitoring and evaluation system. The system allows RSI to collect large quantities of data and to run reports so that we can look at that data in meaningful ways. RSI’s Director of Research, Jennifer Shack, prepares quarterly statistical reports (they can be viewed here), which are shared with the courts and our program partners. These reports have been instrumental in revising program rules and goals by providing concrete data on many aspects of the programs and participants’ experiences. Under the grant, RSI is also tasked with performing two comprehensive statewide evaluations of the programs, one halfway through the grant term and one at the end. The first of these evaluations, covers the period beginning with each of the existing six programs’ launch through December 31, 2014; a second report, which will cover outcomes through 2017, is expected in 2018. The first evaluation concluded that the grant-funded programs are successfully mitigating the effects of the foreclosure crisis throughout the state by facilitating communication between lenders and homeowners, and by establishing a system in which homeowners feel they are treated fairly and with respect. RSI’s formative evaluation shows that, across the board, the programs are successfully fulfilling the grant’s goal of offering homeowners a fair opportunity to save their home. Each program is also providing a process that helps homeowners to understand what their situation is and what their options are for their home. The programs are facilitating communication between homeowners and lenders, so that parties might come to an agreement that is practical and beneficial for both parties. The programs are also fulfilling the courts’ goal of changing the homeowners’ experience with the foreclosure process to one in which they have some control and are treated fairly and with respect. They are doing all of this while moving the cases through the programs expeditiously -- on average, in about three months. Homeowners who complete the programs are likely to keep their homes: In the 17th and 19th circuits, 76% and 58% of homeowners who complete the respective programs reach an agreement to keep their home. Roughly half do in the 16th and 20th circuits. Almost all homeowners report being treated fairly and with respect: In each program, most homeowners felt they were being respected and had the chance to talk and be heard. Their comments spoke of their appreciation for those helping them. Homeowners also appreciated the process itself for helping them understand their situation and how to proceed and for allowing them to meet face-to-face with their lender. Almost all said they were satisfied with the process and the outcome. Homeowners leave their pre-mediation session with greater understanding: In each of the programs, homeowners indicated in post-session questionnaires that they left their pre-mediation session with a better understanding of their options for their home and how to work with their lender. In the 17th and 19th Circuit programs specifically, more than 70%of homeowners indicated that they left with a much better understanding. Cases move through the mediation process quickly: The cases average taking between 63 and 102 days to move from first entering the program to either reaching agreement or ending without an agreement. There is no evidence that the mediation programs delayed the processing of foreclosure cases through the legal system. They were a blessing to us on helping us keeping our home. RSI has curated a collection of the most essential resources on the subject.